Virginia Frew was born in Pittsburgh in 1887 to Mr. and Mrs. William Nimick Frew of Shadyside. Mr. Frew was a personal representative of Andrew Carnegie. Virginia was initially home schooled alongside her best friend, Helen Clay Frick. She later continued her education at Dobbs Ferry School for Girls in New York. Helen Clay Frick, Virginia Frew and Thruston Wright were all members of the Founders Chapter of the YWCA, a chorus of young men and women who entertained audiences to benefit the YWCA. The romance between Virginia and Thruston blossomed while doing these performances. Subsequently, in 1909 Virginia married Thruston in grand style. Helen Clay Frick was her maid of honor. As a wedding present to his daughter, Mr. Frew built the newlyweds a mansion on Fifth Avenue in Shadyside for an estimated cost of $1,000,000. It is documented and verified by USGA Museum periodicals and Wright family records that Virginia competed in the United States and in overseas tournaments between 1919-1921. 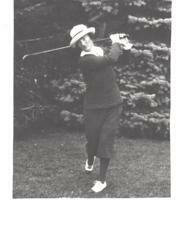 Traditionally referred to as Mrs.Thruston Wright, she represented Allegheny Country Club in two US Women’s Amateur Championships, a British Women’s Championship and a Women’s Open Championship of France. The 1919 US Women’s Amateur was held at Shawnee Country Club in Shawnee-on-Delaware, PA. Virginia lost in the 1st round of match play to Florence Vanderbeck, a previous US Amateur and Eastern Champion. Mayfield Country Club in Cleveland, OH was the site of the 1920 US Women’s Amateur. Virginia lost her first match to Edith Cummings, a 23 year old and soon to be golfing legend. In 1921 at the British Women’s Championship in Turnberry, Scotland, she won her first match and lost in the 2nd round to Cecil Leitch, a 4 time British Amateur Champion & 3 time US Amateur Champion. Traveling from Turnberry to Fontainebleau, France, she advanced to the 4th round and lost to Alexa Stirling, a 3 time US Amateur Champion. Virginia Frew Wright competed amongst a group of ladies who took up the game of golf when it was first introduced in the United States rising the a number four ranking in the 1920's. They were pioneers of the game. Three of those ladies are in the Golf Hall of Fame. Virginia and Thruston had three children: Virginia, Thruston, Jr. and Richard. Sadly, Virginia passed away in 1930 at the very early age of 43. In 1995, Richard Wright, in honor of his mother established the Virginia Frew Wright Player of the Year Award and endowment for the continuation of this award. The player accumulating the most points for finishes in individual stroke play tournaments throughout the season will receive the Virginia Frew Wright Player of the Year award and pin. The pin is a replica of one that Virginia gave to her maid of honor Helen Clay Frick Barbara Wright Russell, a past president of the WGAWP and Virginia's granddaughter awards the pin annually at the WGAWP Fall Meeting to the winner. A permanent plaque with the winners' names will be displayed at Edgewood Country Club. Vicki Smith, Sheila Kassel, Kathy Smith, Sara Steve, Colleen Adams, Sue Colton, Hee Soo Kim, Nancy Harned, Kat Katawczik, Mary Beth Morrissey, Carolyn Morford and Kathy Kunschner. The following stroke play events qualify for Virginia Frew Wright Player of the Year points: Tag Hill, Barnes Murphy, Spring Two Day, Bobby Cruickshank Memorial Qualifier, WGAWP Championship and the First President's Memorial tournament.